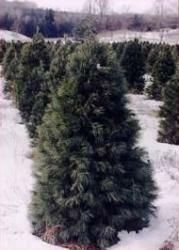 Colorado blue spruce, or blue spruce, is an attractive tree often used for Christmas trees or as ornamentals. The species generally reaches a height of 65-115 feet at maturity with a diameter of 2-3 feet. It has a narrow, pyramidal shape and cone-shaped crown. As trees become older, they often take on a more irregular appearance. More Info.. This is the most valuable of the many varieties of spruce which dominate the Boreal forest and is much sought after by pulp and paper companies. It grows in every province and territory in Canada achieving a normal height of about 24 metres and a diameter of about 60 cm. The strong slender twigs which hold ornaments well, the dense foliage and symmetrical proportions of the spruce make it a very beautiful Christmas tree. 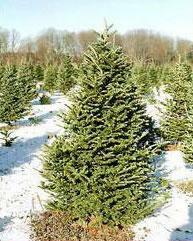 The spruce needs lots of water however, and must be watered regularly to prevent it from losing its needles. More Info.. Many people think that the graceful White pine is the most beautiful of all Christmas tree varieties, even though its soft needles make it difficult to decorate. The White pine is the largest tree that grows in Eastern Canada and can be seen in the north, towering above the boreal forest. In the wild it can reach diameters of 1.5 metres and heights of 45 metres. Because of its size and strength the White pine was once used to make the masts of sailing ships. Today it is valued by carpenters because its smooth, white wood contains few knotholes and it doesn't twist or shrink. More Info.. 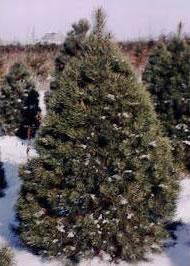 The Scots pine, which is the most popular Canadian Christmas tree, is not a native of North America. In spite of its name the Scots pine is found throughout Europe and Asia. Introduced to Canada by Christmas tree farmers, it can now sometimes be found growing in the wild. The Scots pine is a thick, hardy tree that holds its needles well over the holidays. Trees grown on a farm respond well to pruning and grow in well-rounded conical shapes with few breaks in the foliage. More Info.. 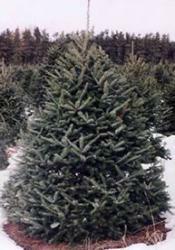 In many respects, Fraser fir and balsam fir are quite similar. Fraser fir is a uniformly pyramid-shaped tree which reaches a maximum height of about 80 feet and a diameter of 1-1.5 feet. Strong branches are turned slightly upward which gives the tree a compact appearance. More Info.. The range of the Balsam fir is almost entirely in Canada and stretches from Newfoundland to Alberta. In the wild, firs take the shape of tall, narrow pyramids about 23 metres high. The wood of the tree is valued by the pulp and paper industry, while its thick, oily sap is used to make some medicines. 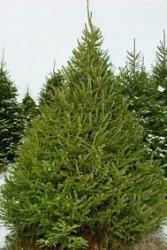 Fir trees hold their needles well and are a good choice if the decorated tree is to be left standing for a long period of time. More Info..